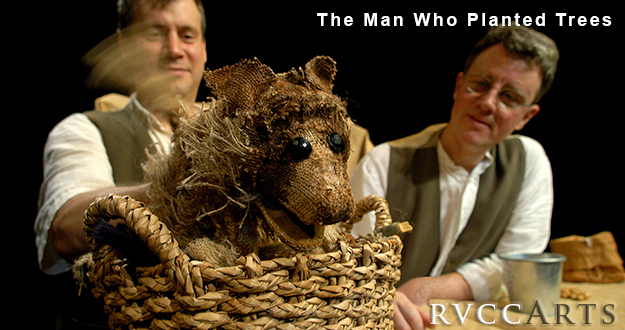 Featuring a unique blend of comedy, puppetry and storytelling, The Man Who Planted Trees tells the inspiring story of a peaceful French shepherd and his button-eyed dog who, amidst the ravages of war, transform a barren wasteland into a thriving, beautiful forest-one acorn at a time. This is a delightful puppet show for young and old—even if you don't have (or know) any kids, don't miss this show! Come and enjoy a fun, FREE pre-show children's activity! Come and enjoy a fun, FREE pre-show children's activity from 1:15-1:45PM in our theatre lobby. Children attending the performance are invited to decorate a flowerpot (we'll supply colored markers and stickers!). We'll also give each child a hardy baby geranium to plant in their beautiful new pot (planting to be done at home). It's the perfect way to celebrate this show's enduring message about caring for our environment. So, bundle up the kiddos, catch a bite at Houlihan's Bridgewater, come early and decorate your pot, and enjoy a great show for the whole family; a show you'll be talking about on the ride home and for days to come.